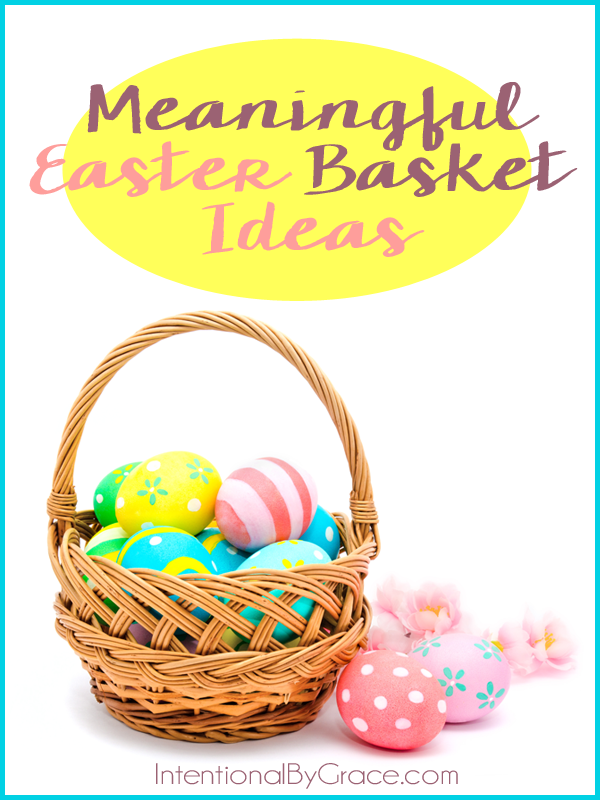 Are you looking for meaningful Easter ideas for your Christian family? 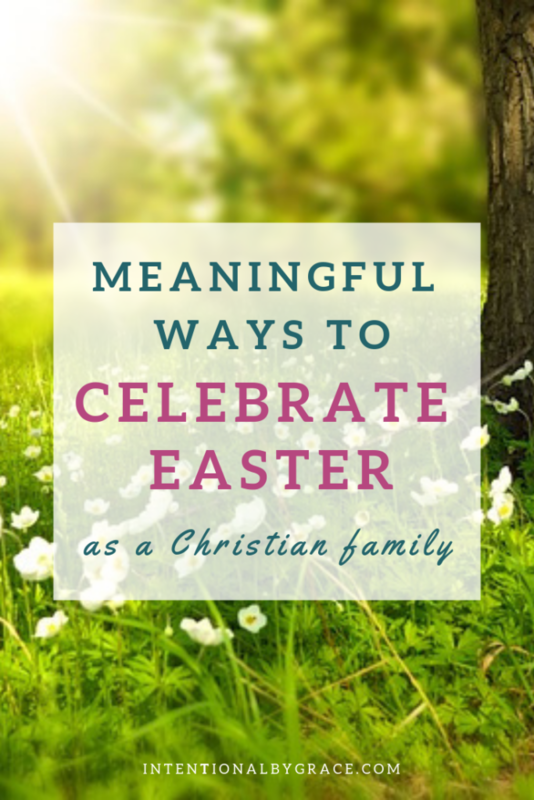 Here are some Easter traditions you can implement in your family for a Christ-centered Easter! Plus an idea for outreach in your community! My husband and I both grew up with similar Easter traditions. I have fond memories of dying Easter eggs with my family the week before Easter. I remember barely being able to sleep wondering how in the world the Easter bunny fit through the front door and why I never heard him hiding the eggs around the living room. We’d gather with cousins for Easter dinner and barely eat a thing because we were too excited about hunting Easter eggs. Easter Sunday was also a time for going to church dressed in our Sunday best – usually brand new outfits and white church shoes. We’d listen to the resurrection story and sing songs about our risen Savior. As a child, I knew that Easter was about Jesus and the eggs were just a fun way to celebrate and spend time with my cousins. Second only to Thanksgiving, Easter was my favorite holiday as a kid. Now I have three children of my own. Creating Easter traditions for our family and teaching our children God’s word is now up to my husband and me. And what a joy and privilege it is to teach our children about Jesus! 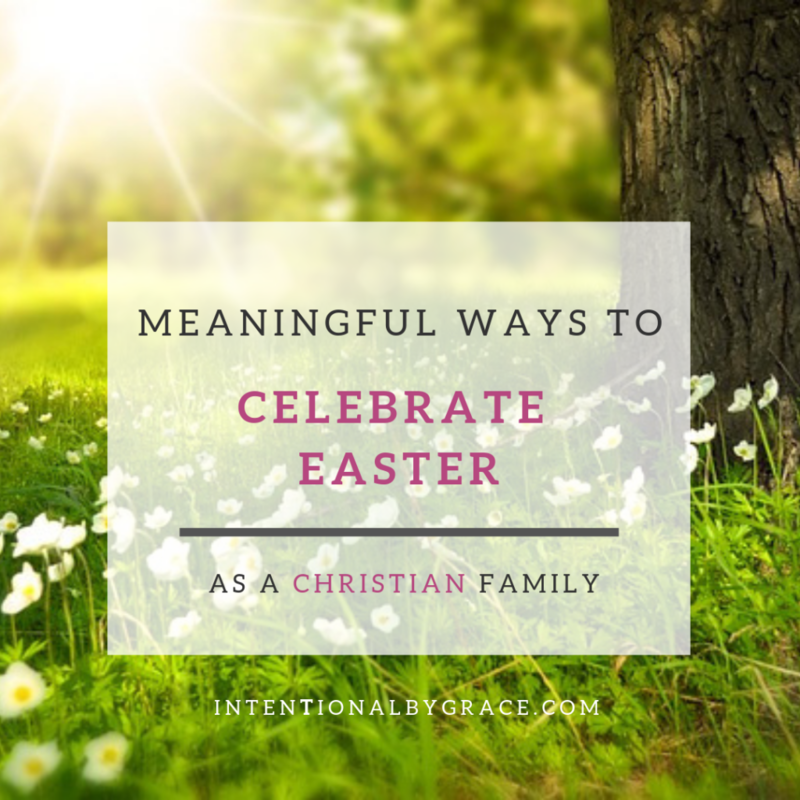 Therefore, today I want to share with you some meaningful ways to celebrate Easter as a Christian family. Or at least I’m going to share with you how we do it. Click the play button below, or click here to watch directly on YouTube. We’ve used several resources throughout the years for teaching our young children about who Jesus is, what He did for us on the Cross, and why the resurrection is worth celebrating. Below are two of our favorite ways to intentionally share the meaning of Easter with toddlers and preschoolers. A Sense of the Resurrection takes you and your child on a journey through the death and resurrection of Jesus in a very meaningful way. You will make memories together as you use their five senses to discover the real story celebrated on Easter. Talking about death with children can be hard though. I love that Oh Amanda teaches in the introduction of A Sense of the Resurrection how to talk about death with our children, how to explain that Jesus was beaten and bruised, and how this story is a sad, but beautiful story – one that changes everything! She encourages us to get on our children’s level and she even gives conversation examples. 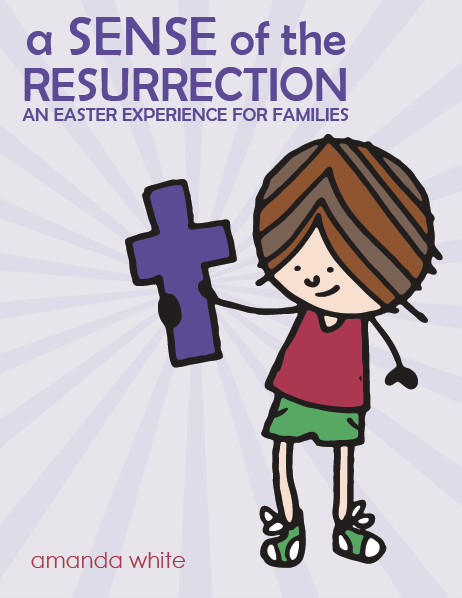 If you’re looking for a way to make memories with your child while helping them understand why we celebrate Jesus’ death and resurrection, then A Sense of the Resurrection is for you! 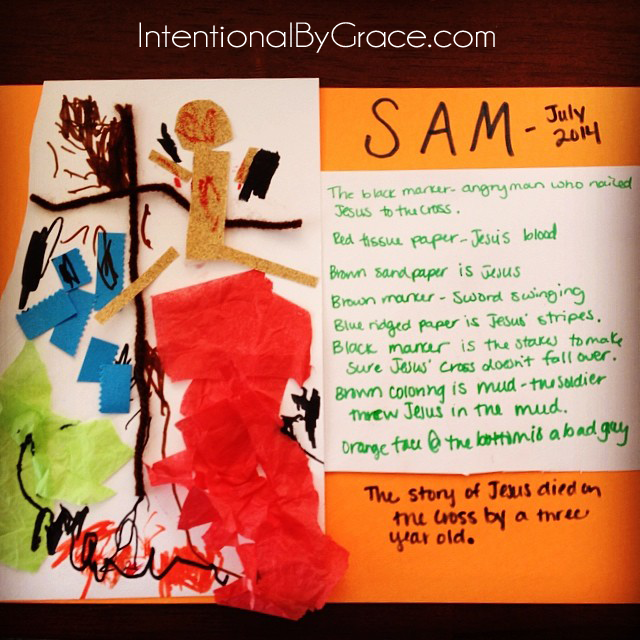 I created the Fruit of the Spirit Curriculum for Toddlers when my oldest was just two years old. I wanted to spend even more time teaching him what he should “put on” as we seek to glorify God together in our days. Even at a mere two years old, he was ready to hear the Scriptures read and taught, and I wanted to do this while teaching him early learning skills. So, the Fruit of the Spirit Curriculum for Toddlers was birthed, and I have now used it with all three of my children. I just started with my little girl, and we are having a blast. 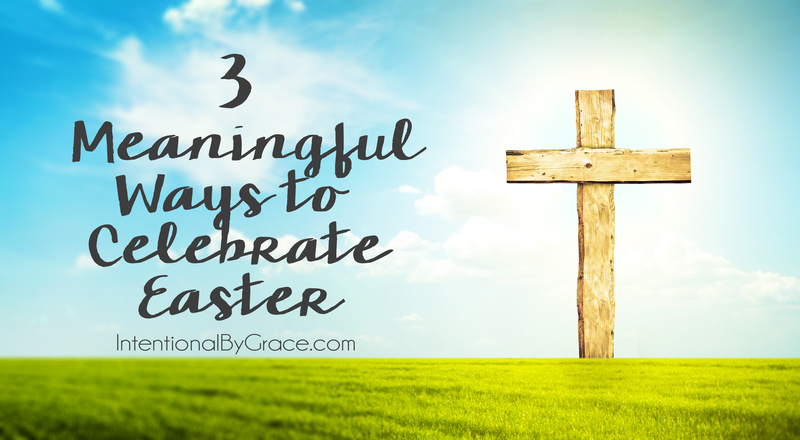 Within the curriculum are three weeks that are perfect for leading up to Resurrection Sunday (weeks 2, 4, and 9). 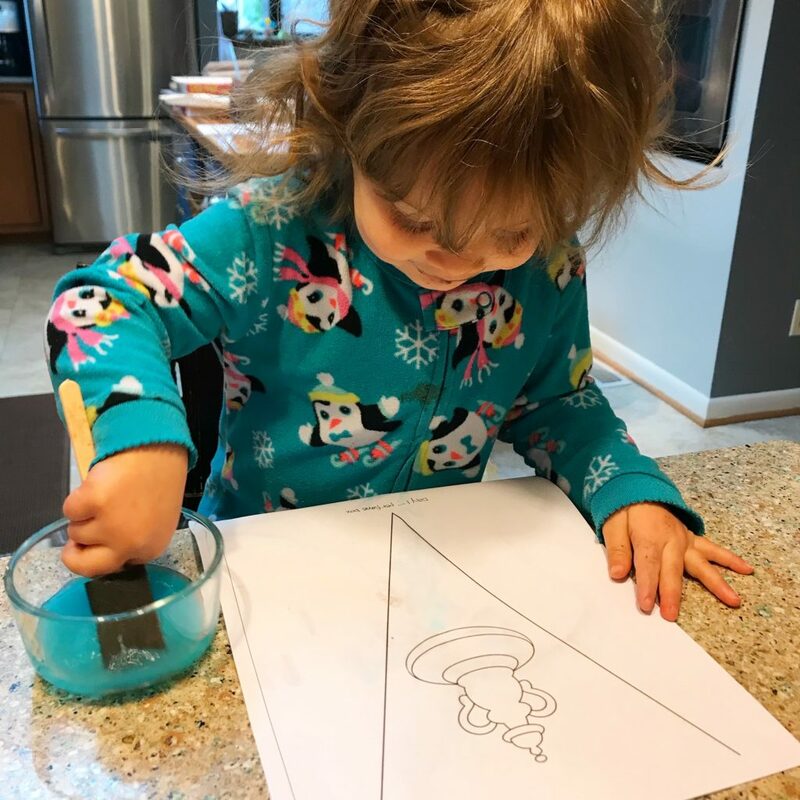 Since you do not have to do the lessons in any certain order, you could choose to do these three around Easter Sunday for a fun, age-appropriate way to share the meaning of Easter with your toddler or preschooler. This is actually what I’m using with my 2.5 year old girl this year. We will be able to cover the Passover, Crucifixion, and Resurrection in a way that she will understand. 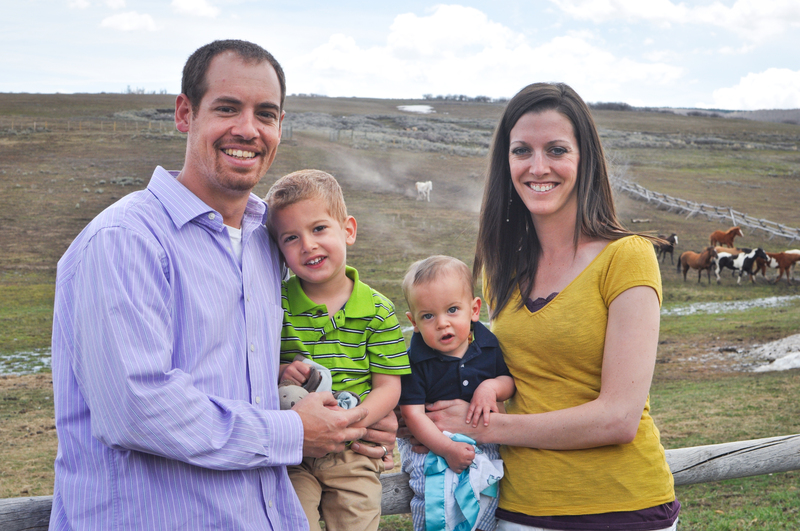 Now that my kids are growing, we have found even more meaningful ways to celebrate Easter. Below are some ideas of things we’ve done in the past, as well as what I plan to use in the future when my youngest is just a bit older. 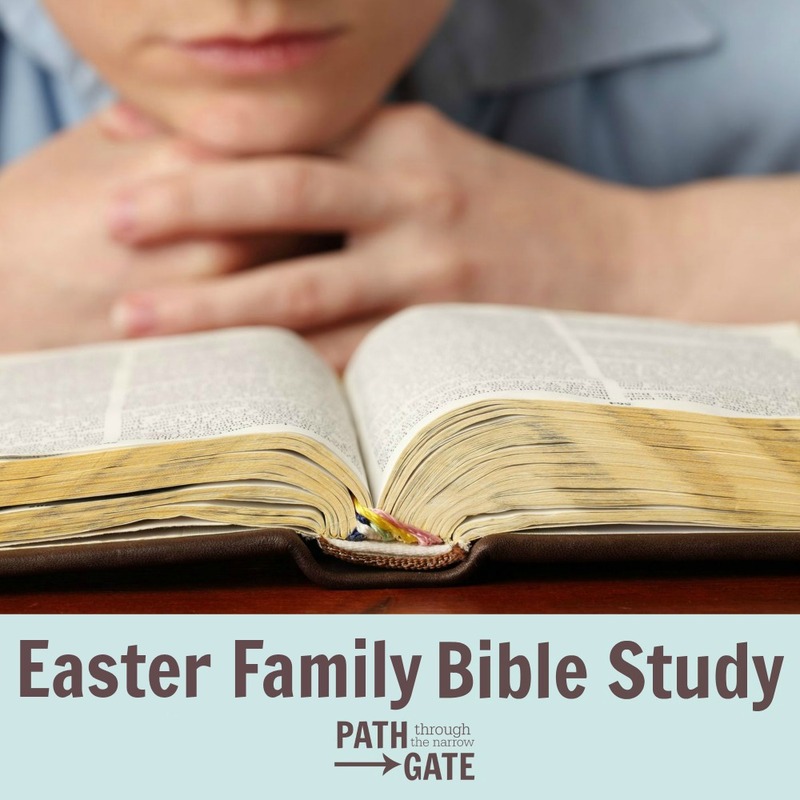 Path Through the Narrow Gate has some phenomenal resources for families seeking to grow in the Lord together. I’ve gleaned so much wisdom from her through the years. 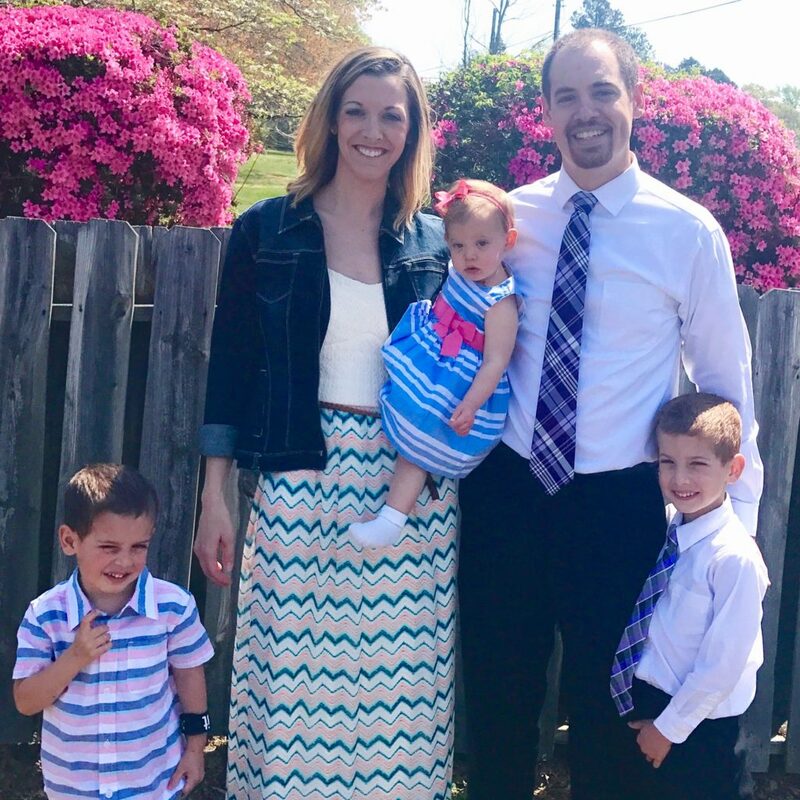 We did her Family Easter Bible Study one year, and it was absolutely amazing. If you want to take a deeper look at Jesus’ death and resurrection with your family this Easter, but don’t know where to start, then this is a great resource. Each lesson in this Bible study focuses on a brief Scripture passage, followed by questions to help you discuss the passage. 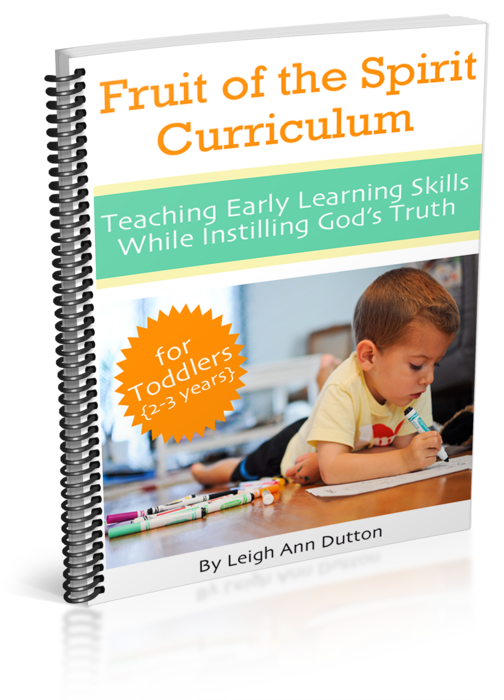 This Bible study is perfect for family Bible time or for independent study for older children. I plan to let my eight year old read through it alone this year during his personal Bible time and talk about it with him later. 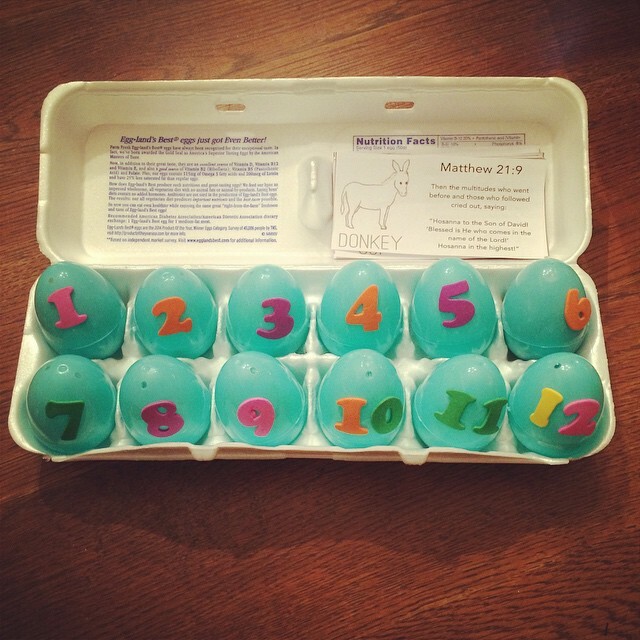 Resurrection Eggs are a great, hands-on way to share the story of Easter with our children. I’ve found this to be a wonderful way to “span the ages,” so to speak, when it comes to talking to my kids about the meaning of Easter. Life Your Way has a great tutorial for making your own (ours are pictured above). We use the story cards that Mandi provided during family devotions. Instead of just the one verse though, we’re reading the entire portion of scripture around the main verse for context and my oldest who is eight can do the reading for us. In addition to reading the Scripture and opening an egg, we will sometimes act out the story or look up a video to supplement the topic. We also choose worship songs based on the scripture reading (YouTube is a great free resource). This activity has resulted in several amazing conversations with our children through the years. If you don’t want to make your own Resurrection Eggs, these Resurrection Eggs on Amazon are really cute. I even thought about getting the book, Benjamin’s Box: The Story of the Resurrection Eggs, to go along with the telling of Resurrection Eggs. We love Arnold Ytreeide books for Advent. We’ve read Bartholomew’s Passage and Jotham’s Journey. I plan to read Amon’s Adventure: A Family Story for Easter next year with my family. Right now though, with a two year old in the mix, it just seems like a bit more than I could handle this year. However, if you have older children (upper elementary to high school), then Amon’s Adventure would be a great way to share the meaning of Easter together. 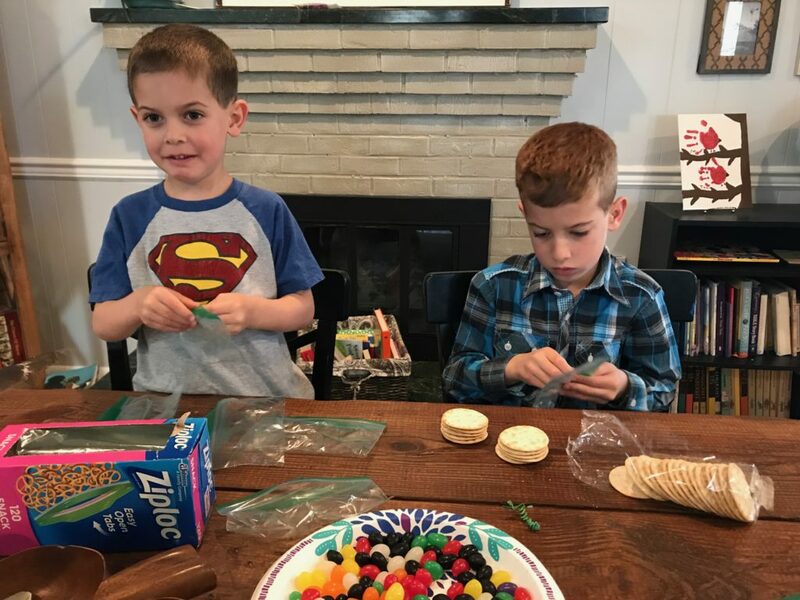 One year my oldest son had the idea to hide Easter eggs at people’s homes, and he wanted to hide jelly beans inside them to tell the story of Jesus. Oh, and he wanted to give them juice and crackers so they could take communion together. After a couple of weeks of talking, and figuring out that he was very serious about this idea, I went along with it and we helped him refine it. We grabbed some cute little baskets from the Dollar Tree and filled them with grass. 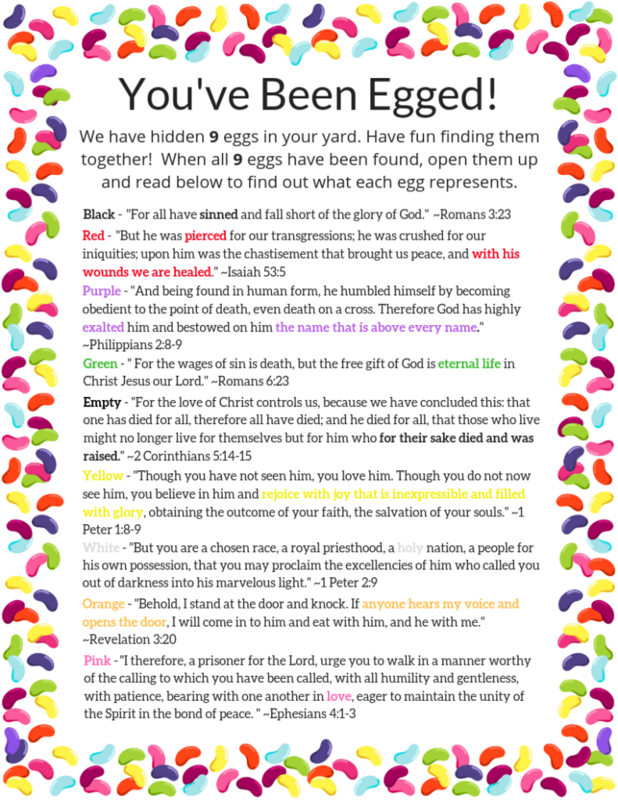 Then we placed various colored jelly beans inside nine eggs to help tell the story of Jesus’ death and resurrection. 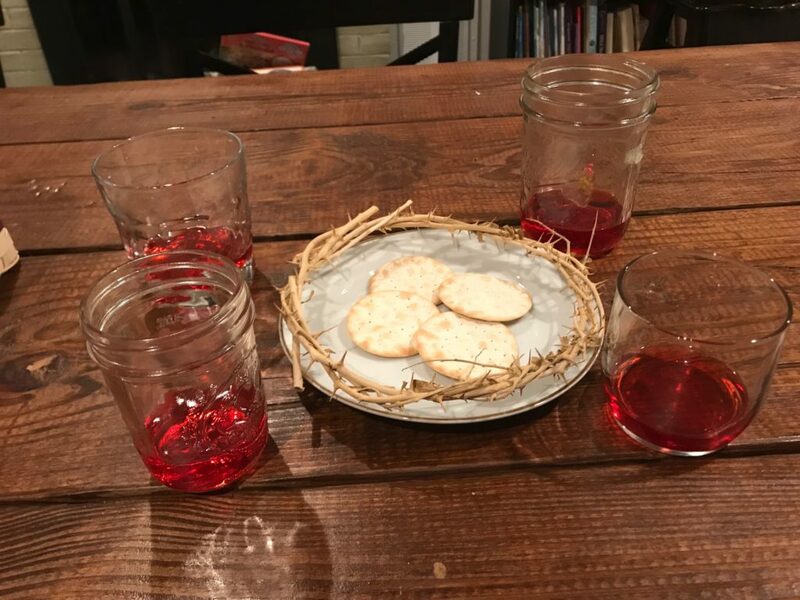 We included juice and crackers along with instructions on how to take communion together, as well as a story for each colored jelly bean. We made a list of people we knew who didn’t have a church home yet, as well as anyone we thought might like a fun family devotion. 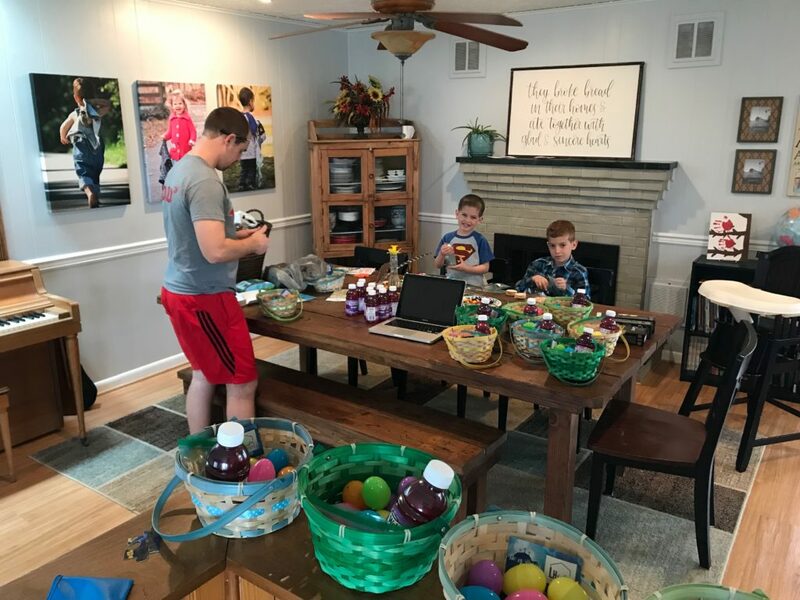 In our letter, we invited them to celebrate Easter with us, and if they didn’t have a church home we told them where we would be celebrating as a family and invited them to join us. After we had everything prepared, we snuck out while everyone else was at school (benefits of homeschooling! ), and egged people’s homes. My boys got such a thrill sneaking into people’s yards and hiding eggs everywhere. They’d sneak up to the door and drop the basket and run to the car all giggles and happiness. Not only was this a lot of fun, but it was fun to hear the stories of people who found them. The best part? We watched a family get baptized recently at church who we egged last year. Of course we take ZERO credit for their salvation, but it’s neat to think that we might have planted a seed that would later take root in salvation. Right from our own neighborhood! If you want to try this out yourself, click here to download the printable I created. You can use it the way it is, filling in the blanks with your own information, or use it as a template to craft your own plan. Most families enjoy doing Easter baskets on Sunday morning, and we are one of those families. However, we wanted to use them as an opportunity to illustrate, and make personal, the sacrifice of Jesus on our behalf. 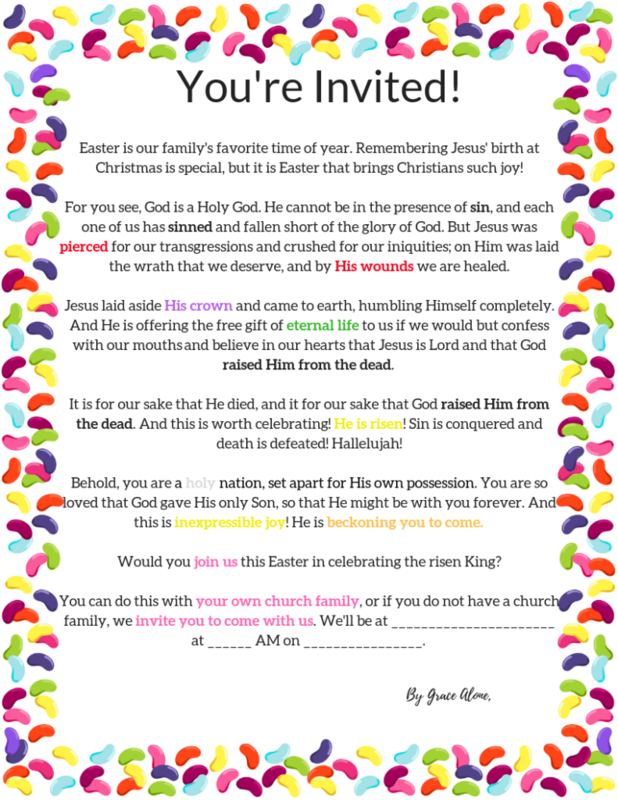 I found this idea from God Centered Mom while researching ways to bring the story of Easter to life for my kids. The night before Resurrection Sunday we write sins on pieces of paper, and together we place them in our baskets. We put a drop of vinegar on our tongues to remind us of the bitterness of sin, and we thank Jesus for His sacrifice. A friend of mines gave me a crown of thorns, that we keep on the table during our time together, and after confessing our sins, we take communion together as a family. We wrap up our time with a couple of hymns. Then, we cover the baskets with a blanket or something similar (to demonstrate the burial of Jesus). The next morning when my children come to breakfast, the blanket is gone and in place of their confessed sins they will find gifts! We explain how Jesus took all our sins away when He died on the Cross, and now He has risen so that we can have eternal life with Him. I highly suggest reading God Centered Mom’s post for a more thorough synopsis. I found her post incredibly helpful! 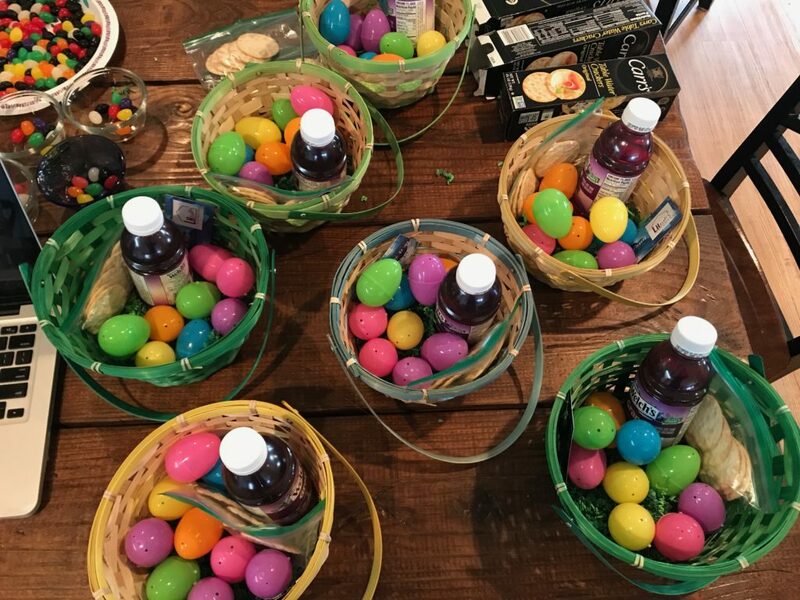 My children’s Easter baskets are usually filled with something that will encourage them spiritually along with a few trinkets and some candy. 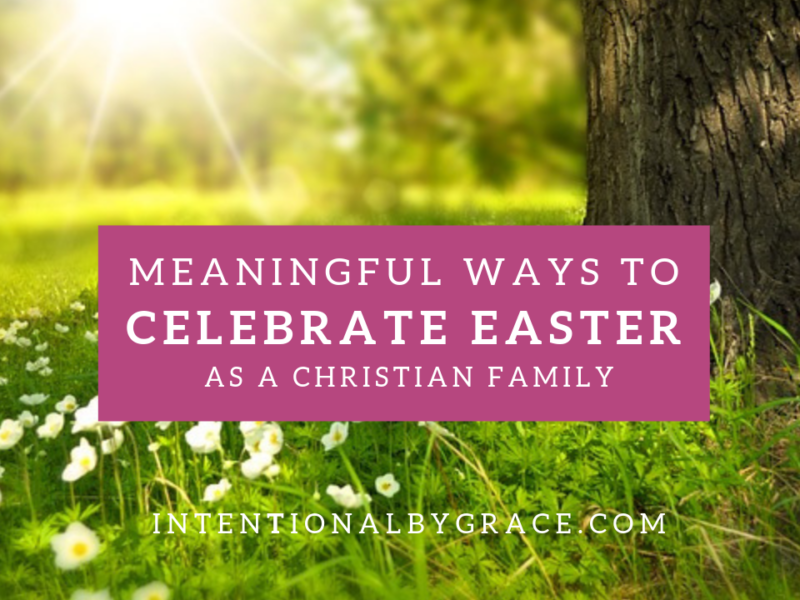 Easter is a time of celebration for the Christian Family! Jesus’ death means nothing without the resurrection! 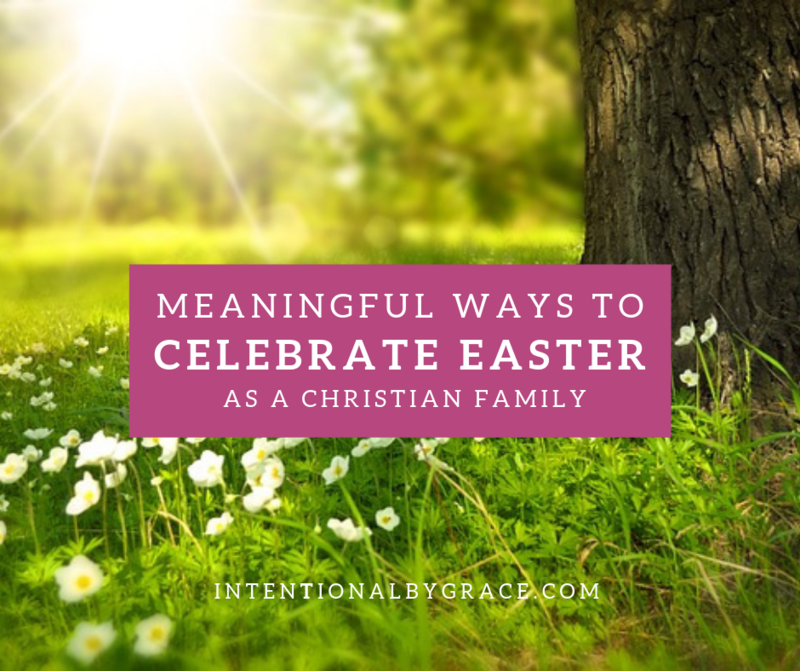 I hope you found some inspiration in this post for how to create a meaningful Easter celebration with your family. What about you? What Easter traditions do you share with your family? These are great. We are doing the same Easter basket idea this year too! I read about it last year on ohamanda.com, but didn’t think a two year old was quite ready. I’m excited to try it this year! We already did our baskets on the first day of spring (idea also from ohamanda). 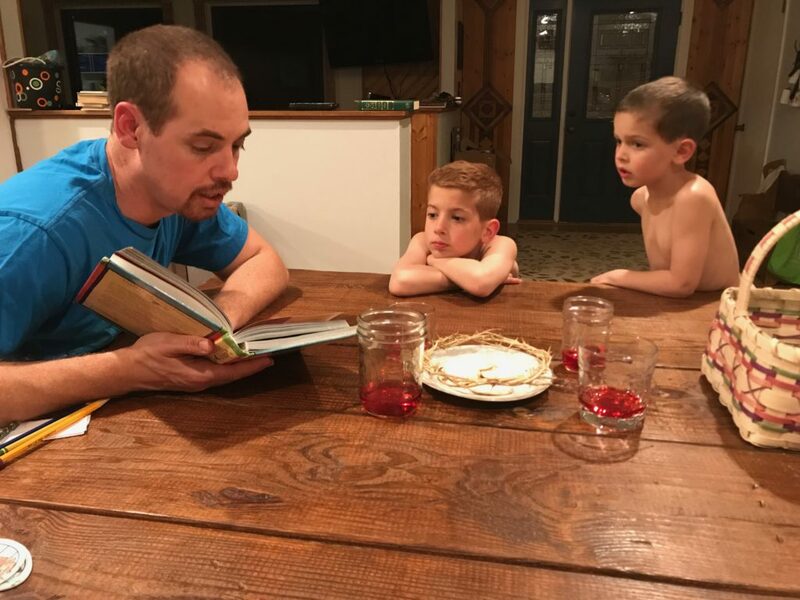 On Easter, each of my boys will get a Bible/devotional/Easter book as well as a copy of the verse my husband and I have chosen to pray over them for the following year. The verses will be hung in their rooms. We also read te story in the Jesus Storybook Bible together. Oh I love the idea to give them a copy of the verse you’re committed to praying over them for the next year!